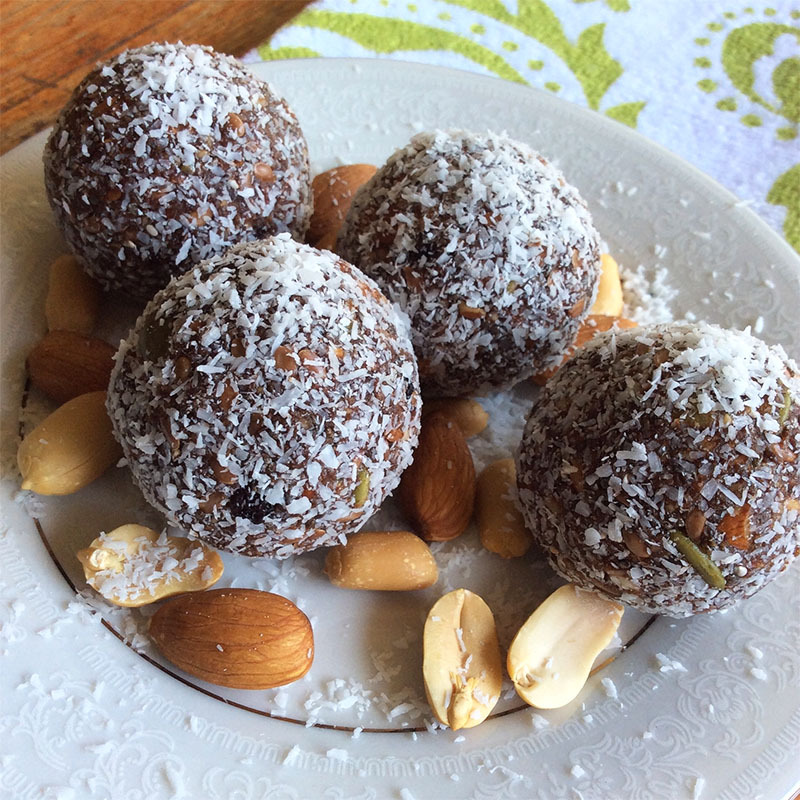 Bliss balls are one of my favourite healthy snacks. They taste great and are full of nutrition too! They also keep well for a few weeks in the fridge so I like to make them in a big batch. Place the almonds in a food processor and process until almonds are small chunky pieces (not completely ground). Then remove ¾ and place into a large bowl. To the remaining almonds in the food processor, add the dates, ¾ cup desiccated coconut, cinnamon and cacao powder, and then process until the dates are chopped fine and the mix starts to stick. Then add the peanut butter, coconut milk and water and process further until the mix is well combine and really sticks together. You may have to stop during the processing and scrap the bowl a few times. Once done, empty the date mix into the bowl that has the almond pieces you separated earlier. Add the chia seeds, linseeds, pumpkin seeds and currants. Use your hands to mix all ingredients togeth until well combined. In a separate bowl add the additional desiccated coconut. Then grab small pieces of date mixture and roll into 2-2½cm diameter balls (this gets a bit messy and you may have to scape some mixture off your hands occasionally, I usually roll the balls all before I coat them). Then roll each balls in the coconut to coat. Once done store in airtight contained in the fridge.You can have one ball as a snack or dessert with a cup of tea. regularly, if so then you will definitely take good knowledge. but this web site provides quality based content. Just wish to say your article is as amazing. The clearness in your post is simply excellent and i could assume you’re an expert on this subject. the blog world but I’m trying to get started and create my own. Do you need any coding expertise to make your own blog? go to see this weblog, Keep up the fastidious job. you’re working with? I’m planning to start my own blog soon but I’m having a hard time choosing between BlogEngine/Wordpress/B2evolution and Drupal. After looking over a number of the blog articles on your blog, I seriously like your technique of blogging. Although internet websites we backlink to beneath are considerably not related to ours, we really feel they may be basically worth a go by means of, so possess a look. That will be the finish of this article. Here you will uncover some web sites that we consider you will value, just click the links.